First things first, it’s really hot in Barcelona in July. Like, high 90s and totally still. We began the day early, before it was too sweltering, sitting on our terrace watching the Swifts diving around for breakfast. Then, it was off to the train station for the trip to Figueres, home of the Dali Mausoleum. 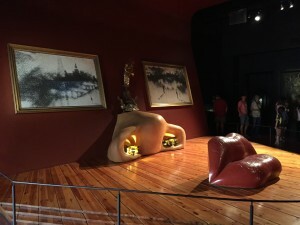 Dali designed and curated the Mausoleum himself, mixing his work with some of his favorites by other artists. It’s a lot of fun, with some interactive (coin operated) pieces and plenty of weirdness. Kat’s favorite pieces were a series of paintings by a close friend of Dali, Antoni Pitxot, who painted stone and lichen. After the Dali museum, we wandered Figueres a bit, grabbed some lunch, and visited the regional museum (it’s a bit .. sparse) and the toy museum. 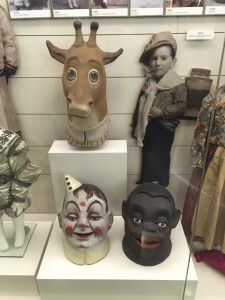 Which is essentially the Museum Of Reasons Your Parents Are A Little Broken … toys used to be really weird. It didn’t help that the muzak in the museum was haunting, depressing xylophone music. After being suitably creeped out, we circled back to the Dali Jewels exhibit, which collects a series of jewelry pieces he designed. Kat was blown away – both by the quality of the work, and the sheer amount of gold. 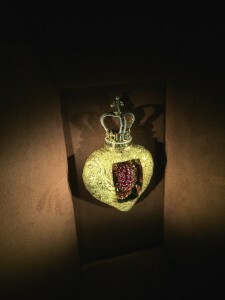 Many of the pieces were articulated and even automated, like a gold heart that “pumped” its jeweled core. Not a lot of practical pieces, but plenty to impress. By this point, we were feeling a little overheated and worn out, so we claimed a bench in a park, broke out our Kindles, and read / snoozed for a while. Then it was time to take the train back to Barcelona. We took it easy tonight, taking the metro to a tapas restaurant, then strolled the Ramblas for some churros with chocolate. Now it’s time for infinite sleep.